This article is about the SPARTAN-III. For the creator of the SPARTAN-II program, see Catherine Halsey. "In recognition of this, her unparalleled brilliance, we honor her as the true genius of Noble." — The Monument to Noble Team. 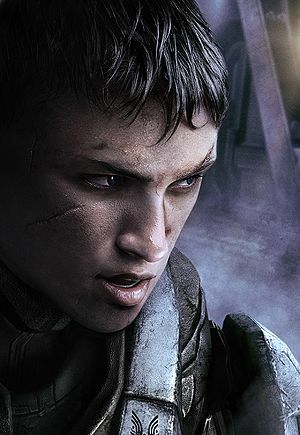 Lieutenant Commander Catherine-B320, commonly known as Kat, was a SPARTAN-III commando of the UNSC Naval Special Warfare Command, attached to Special Warfare Group Three of the UNSC Army. She fought with NOBLE Team as Noble Two during the Fall of Reach in 2552. Kat was born in Monastir, New Harmony in 2530. Her father was killed in action on Harvest and her mother died of cancer in 2536, so she was raised by her grandmother, a retired Army General; this fact made her conscription into the SPARTAN-III program politically inconvenient. However, when Kat's grandmother was killed during the fall of New Harmony, ONI seized the chance to induct Kat as part of Beta Company. Because of her skill and potential, she was marked for a special assignment shortly after her augmentations, and was eventually taken out of the general population of Beta Company by Kurt Ambrose and Franklin Mendez after Operation: CARTWHEEL, not long before the disastrous Operation: TORPEDO commenced. She was later assigned to Noble Team when it was formed. On April 22, 2552, Kat put together an operation to destroy a CCS-class battlecruiser maintaining position above a city on Fumirole. The operation was successful, but at the cost of Thom-A293. The operation also cost Kat her right arm, which has been replaced by a robotic prosthetic. Kat clearly has no problem working with the arm, which she moves just as naturally as her real one, even continuing to hold her M6G pistol in her dominant right hand. Both Carter-A259 and Kat took responsibility over the death of Thom, unable to admit that the death of the SPARTAN was his own fault. Thom was replaced on Noble Team by SPARTAN-B312 a few months later, just prior to the Fall of Reach. At some point during her career, Kat developed a bypass system for the MJOLNIR armor's safety limiters on their actuators and "muscles", allowing a short burst of superior performance at the expense of the suit's coolant systems, leading to overheating. Kat returns the data module she stole from Visegrád to Dr. Halsey during Noble Team's debriefing at SWORD Base. The SPARTANs of Noble Team participate in an operation to investigate a communications blackout at the Visegrád Relay, a mission that led to the first confrontation with Covenant forces on the planet. In the operation, Kat recovered a data module containing Laszlo Sorvad's "latchkey discovery" from the Relay's console and uncovered an unfortunate discovery; the Covenant has successfully deployed their forces on Reach. The discovery led the team to SWORD Base, currently under siege by Covenant forces and their corvette. Kat and Noble Six engaged the Covenant forces on foot and repelled them off the site and the airbase. The team was debriefed by Dr. Catherine Halsey following the attack, and Kat returned the module containing Sorvad's data. Intelligence gathered from Noble Six and Jun-A266's reconnaissance mission lead to a large-scale UNSC assault on a Covenant-occupied site. Kat and Noble Six engaged Covenant forces on the groundside while other members of Noble Team provided aerial support. Noble Six assisted Kat in reconnaissance of the Covenant-occupied site, destroying multiple aerial defenses and unveiling a large Covenant installation codenamed Spire One. Kat telling Carter her plan for Operation: UPPER CUT. The destruction of the UNSC Grafton by a Covenant CSO-class supercarrier, Long Night of Solace, after the Battle at Szurdok Ridge prompted Carter and Kat to reassess the situation. Recognizing the presence of the supercarrier as a large threat, Kat suggested to Noble Team to reconfigure a slipspace engine into a makeshift slipspace bomb, which would destroy the supercarrier immediately. Carter, along with Kat, Jorge-052 and SPARTAN-B312, helped UNSC ground forces repel Covenant invaders from a UNSC base, which housed the Sabre Program Launch/Research Range. Noble Team was separated from this point, with Jorge and Noble Six participating in Operation: UPPER CUT while the rest focused on groundside operations. At some point during the Fall of Reach, Kat and the remaining members of Noble Team assisted the UNSC in repelling the Covenant from civilian population centers. They reunited with Noble Six during the Siege of New Alexandria and helped in the neutralization of Covenant jammers and the evacuation of ONI personnel. Soon, Noble Team was hailed by its superior, Colonel Urban Holland, and was ordered to destroy Sword Base. The team was forced to enter a radiation bunker to shield them from the Covenant's glassing of New Alexandria. As Noble Team exited the elevator and ran towards the bunker, a Sangheili Field Marshal in a Phantom overhead shot Kat through the head with a needle rifle, killing her instantly. When the surviving members of Noble Team were extracted on August 26, Carter carried her body out of the bunker. "This one seems to like me. Someone kill it." Kat generally exhibited a sardonic attitude and had a dry sense of humor. She was described as brilliant, athletic, an inspired tactician and exemplary combatant. She was also noted for her skills as a cryptanalyst and a hacker; allegedly, there had not been a system yet that she has been unable to crack. According to Colonel Urban Holland, she had a habit of occasionally investigating classified intel more than her superiors would like her to. Her ability to acquire and digest information has been described as "supernatural"; more than once, she was able to read a situation, working with information many would find overly limited. Kat shared a close bond with Noble Team's leader, Carter-A259 due to the two being the only survivors of the original roster of Noble Team. She acted as Carter's second-in-command and was fiercely loyal to him and the team. Carter greatly valued her tactical input and planning ability and was particularly upset about her death. Much like Carter, Kat blamed herself for Thom-A293's death while it was apparent that neither was responsible; according to Colonel Urban Holland, Thom died because he pursued a group of enemies by himself rather than waiting for backup. Kat's death can be attributed due to a fatal lack of situational awareness. Like the loss of her right arm in a previous operation, Kat underestimated the gravity of her situation and failed to initiate her armor's shielding system. However, another explanation could be that excess radiation from the nearby Covenant glassing shorted out her shields, as she may have been exposed to the radiation longer than the other members of Noble Team. Kat wore MJOLNIR Mark V armor with an Air Assault helmet upgraded with a Command Network Module-Improved, which can only be used by the player with an Up Armor plate as well, incorrectly called FC-I. She wore FJ/PARA shoulders on either arm and had a Tactical/Hard Case utility on her left thigh. Kat also notably sported a robotic prosthetic in place of the right arm she lost during an earlier operation. Check out our collection of quotes related to Kat-B320 in its quotes page. Kat was voiced by Alona Tal. Kat's voice is available for use in Halo: Reach's Firefight mode. As shown in an early production note, Kat was originally intended to have been born in 2529 and to have been a member of Alpha Company. In this version of the story, she and Carter were the last remaining members of a SPARTAN-III team known as "Blue Team", (not to be confused with the SPARTAN-II unit). This is apparent in the similar coloration of their armor in early concept art. During gameplay, Kat is the only member in Noble Team other than Noble Six that has a secondary weapon holstered. Kat is one of only three Spartan-IIIs known to be held under the ONI Directive 930 and listed as MIA. Kat's helmet is available as an avatar award and is obtained by earning an Avenger Medal in Matchmaking. Kat's armor is available for both male and female avatars, but it lacks her cybernetic arm. A prosthetic arm similar to Kat's is available in the Armory on three different chest pieces, but none of them are default like hers. According to the Halo: Reach Legendary Edition developer commentary, due to a glitch early in the game's development, Kat laughed when the player killed moa, as she was programmed to occasionally laugh when the player killed Covenant forces. Later during the commentary, Lee Wilson jokes that Carter was upset by Kat's death because "She was cute." Martin O'Donnell responds, "We know there was some relationship between Carter and Kat at some point." During the 2010 Penny Arcade Expo, a hired cosplayer dressed as Kat was escorted by the Bungie staff where she entertained many of the visitors by dancing. During the event, she was depicted by the Charisma model Jordan Konkel. Kat is frequently held by the community as a bad driver of any vehicle, mainly due to clips of her betraying teammates or driving off cliffs posted on the Internet or on Rooster Teeth's Halo: Reach series "Fails of the Weak". In reality, her AI is no better or worse than the rest of Noble Team's, though the flaws in her own appear more often because she accompanies the player for more missions than any of your other team members along with it being rare to be able to get the other members of Noble Team to drive a vehicle in game (the two easiest times being at Rally Point Alpha with Carter-A259 driving the truck the player uses and the area of Pillar of Autumn where the player and Emile-A239 acquire a Mongoose shortly after the first fight in the mission). Her purported driving skills have developed into a memetic status, enough that she is even jokingly blamed for driving accidents in other games outside of the Halo series. Concept art showing Kat-B320 commanding Army soldiers in a civilian area. Kat and Carter are debriefed by Catherine Halsey. Halsey demands that Kat return the data module she stole from Visegrád. Kat from A Spartan Will Rise ViDoc. Kat's eyes reflected in her cracked visor in the Deliver Hope trailer. Kat gets shot through the head by a round from a Needle Rifle while her shields are down. Carter carries Kat's body while the others wait for evacuation. Kat's Mjolnir armor from the Making of Deliver Hope. Kat as depicted by Jordan Konkel at PAX.